With the Rubicon IPO now in the rear view mirror, Wall Street is finally warming up to the ad tech industry in a way it hasn’t since 2007. Since the start of 2014, ad tech companies like PubMatic and Tubemogul, have already set in motion rumored IPOs for hundreds of millions of dollars. Even transactions between private companies, like Lithium’s purchase of Klout, could be made in anticipation of a public outing. The sheer size of the advertising marketplace, coupled with the continued shift of dollars from analog and traditional media to digital, translates into many appealing opportunities for investors. Recently, PwC US and the IAB announced that digital ad spend in 2013 surpassed television for the first time ever, totaling $42.78 billion, up 17% from the $36.57 billion reported in 2012. That said, the ad tech landscape is littered with nearly indecipherable competitors who now sit between advertisers and publishers within the new, complex ecosystem. With more ad tech IPOs on the horizon for 2014, what should investors be looking for? Twenty-five years ago, stock trading shifted from the trading pits of the New York Stock Exchange to electronic platforms like NASDAQ. Similarly, digital advertising is now quickly moving from traditional media planners at large agencies using Excel spreadsheets to real time bidding platforms through ad trading desks using big data, big hardware, and exclusive algorithms. This transition is revolutionizing the industry, and companies going public must have the technology chops to match ad inventory to a buyer quicker than you can blink your eye twice. If not, they are likely going to be squeezed out of the marketplace. The adage du jour in the advertising industry is, “What can be bought programmatically will be bought programmatically.” So make sure you understand how the company plans to live in the brave new world of programmatic ad trading and make sure you aren’t buying the dinosaurs of the digital age. “Big data” is a buzzword that everyone in the industry likes to use because it makes them feel relevant, but the reality is that most companies in the ad tech space have big data; what’s more important is how they use it. It is the natural consequence of seeing millions of ads and cookies move across the ecosystem. The real question is: how does big data translate into big insights? As more and more companies look to data as a way to unleash big insights for their clients, the challenge is to have the right people and the right tools to go deep and understand audiences on a level that drives advertiser results. Airlines have been doing this for years with maximizing yield, oil hedging, and the infamous insight that removing one olive from a salad reportedly saved American Airlines $100,000 a year. So when looking at companies coming to the market, ask how they are using data to generate big insights. How many quants do they employ? What do their advertiser reports show? How many data variables do they analyze across each impression? Many S-1s refer to “using big data to find the right audiences,” but few companies actually live and breath it. Porters’s Five Forces theory, which is taught at many business schools, teaches commoditization of a product over time leads to lower margins. In the ad tech world, keeping margins high is a huge challenge. 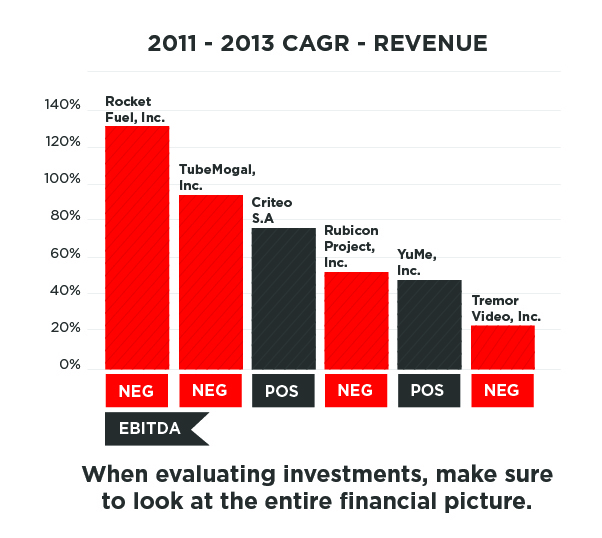 One of the biggest challenges to margins is Traffic Acquisition Costs (TAC). This is the holy grail of margins, especially for companies like Rocketfuel, Criteo, Tremor, and Yume, which recently went public. Unlike companies like Google, these players must pay others (such as publishers, like CNN.com) for showing advertisements to consumers. Investors should be looking closely at the TAC of companies to ensure that it is at the very least, stable. An increase in TAC may indicate a company that is lacking in technology prowess and will likely see margins decline over time. If it is a SAAS based company, ask what the renewal rates are and if the average contract value is going up or down. Companies with a great corporate culture are more financially successful than are their peers. The Russell Investment Group proved this when they tracked the financial performance of a hypothetical portfolio of publicly traded “Best Companies,” compared with the S&P 500 and the Russell 3000. Cumulative returns for the Best Companies between 1998 and 2009 were over 224%, compared to 42% (S&P 500) and 47% (Russell 3000.) There are no other factors that can explain this significant, consistent, historical return on investment. A company coming to the public markets will need to hire, recruit, retain and inspire their teams in order to produce oversized returns. Crowdsourcing has made peering into this “soft” side of a business much easier. Investors should check sites like Glassdoor.com and Indeed.com to determine if the team that writes the code, sells the products, or analyses the data is happy. Companies going public are often consumed with the here and now of a market. They say they want to innovate, but their products and services are nothing more than a reflection of the current market. They are stuck in today’s paradigm, eking out incremental change and riding the wave. What should investors look for? Years ago, Wayne Gretzky said: “Skate to where the puck is going to be, not where it is.” Steve Jobs referenced this quote a few years ago at the launch of the iPhone, to describe Apple’s strategy. Companies need to understand how to develop their product road map around what the problem will be in the future. This one of the biggest differences between good and great companies, and great companies make great IPOs. Does the company make money? Simple question, simple answer. And yet many “hot” tech companies can’t answer this question in the affirmative. Going for growth and investing in your product is all fine and good, but investors ultimately buy public companies because they value free cash flow. There are a few companies that can lose money indefinitely or invest with abandon. Amazon is one such company. Is your investment like Amazon? Has it shown a strong ability to create long term, recurring profitability and strong cash flow? While top line revenue growth is important to focus on, also make sure EBITDA and net income are positive and trending up. Companies like Facebook and Groupon saw disastrous IPOs, demonstrating that investors were skeptical the trendy companies could monetize, and withheld their money accordingly. Like other industries, ad tech companies have consistently gone through a boom and bust cycle, rising dramatically when the markets realize how much money is spent and will likely be spent after ad dollars inevitably move from TV to digital, and then falling out of favor when a new industry (such as clean tech) comes into vogue. Nonetheless, there will always be an advertising industry, and ad tech companies are a part of the industry’s burgeoning, fastest-growing segment. Wall Street investors are paying attention. And so they should. Next Are You Sure Your Startup Is Solving a Problem?